Sure, according to the calendar, it's the first week of winter -- but the next few days are going to bring some incredible warmth. Highs on Tuesday will be in the upper 50s and lower 60s. The roller-coaster weather won't just be the spring-like warmth, though -- there's also a chance for showers Tuesday and Wednesday. 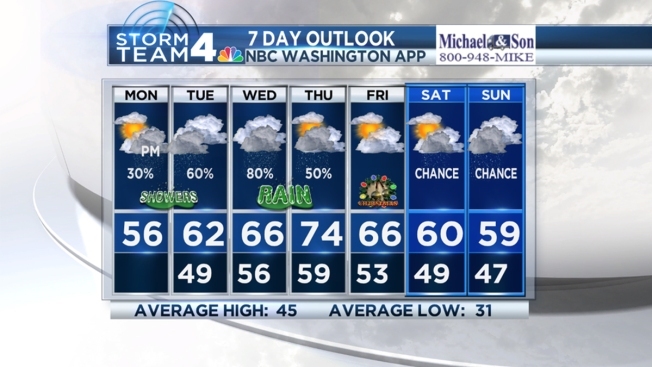 We expect light showers on Tuesday, with rain ramping up Wednesday. That day, we could see areas of heavy rain through the day, so have that umbrella handy. By Wednesday, we'll get into the low to mid 60s. But Christmas Eve will be the real jaw-dropper; we're expecting temps in the mid-70s. Yes, you read that right. You just might want to get out your spring clothes again. Christmas Day will start in the 60s, with falling temperatures during the afternoon with a chance of rain by early evening. As of Monday afternoon, the Christmas Day high is forecast for a high of 66 degrees -- that would put us in the top five warmest-ever. Even the mornings will be mild the rest of this week. Temps will be in the 60s both Christmas Eve morning and Christmas morning. The average high for this time of year is just 45 degrees. We are expecting to not only break, but shatter that record Thursday. The record high in D.C. is 69 degrees.